Yayoi Kusama’s Infinity Nets strike me as both visually captivating and critically problematic. It is hard to think of another contemporary artist celebrated for so precisely reiterating the work that first brought her to the attention of the New York art world 54 years ago. The rules of abstract modernism that normally apply – of discernible progress and development in concept and execution – are here suspended. Is this because of her ambiguous status as the ‘outsider’ artist operating inside the art world? Or because of her exceptional status as an ‘eastern’ artist whose work appears to intersect with western concerns? The spare, pulsing, repetitive and monumental quality of her Infinity Nets (the one above painted this year) were initially identified by Donald Judd and others as exemplifying the developing East/West dialogue that informed the Zen minimalism of late 50’s and early 60s American abstraction (alongside Ad Reinhardt, Agnes Martin, Robert Irwin and others). Later on they came to mirror other concerns, both artistic and cultural, ranging from the psychological study of obsessive behaviour and mental illness (and illustrating the new fashion for ‘outsider’ art) to the aesthetic exploration of ‘white noise’ in an electronic age and the current fascination with generating depthless and infinite fields in a virtual world. Yet through all this her cosmic landscapes remain the same, continually repeating and returning to their own starting point. They are ‘out of time’ in the same way that native Australian art is; both apparently belonging to an abstract tradition and yet remaining apart, subject to their own laws and seemingly immune to standard critical judgements. 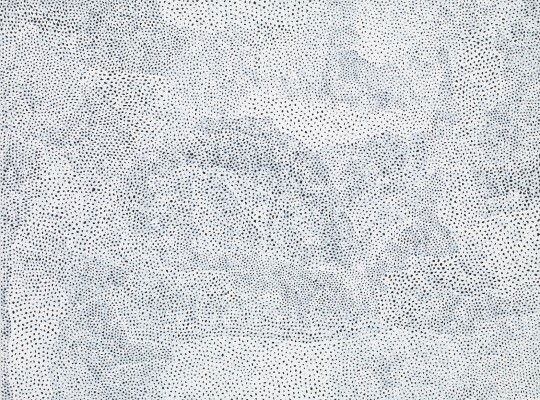 There is clear visual overlap between her Infinity Nets and the work for example of Uta Uta Tjingala and Emily Kame Kngwarreye (particularly with her astonishing ‘Big Yam Dreaming’, shown below) in the current RA survey of Australian Art - so why is it that their work continues to remain separated by cultural otherness while Kusama’s does not?